‘Le Parsonage’ and ‘Le Vicaredge’. The use of the terms ‘Le Parsonage’ and ‘Le Vicaredge’ need some clarification to avoid confusion in the following text. ‘Le Parsonage’ refers to old the glebe land at the junction of the present Church Street and Oak Hill (Vicarage Lane) which was the site of an old barn which was believed to have been a seventeenth century tithe barn, the remains of which were demolished in the mid-1950’s to make way for the bungalows which now occupy the land. From Church Street up to the brow of the hill was once known as Parsonage Field. A terrier was a list of property and possessions belonging to a church made at infrequent intervals through the centuries. There are four in exististence for St. Mary’s Church. The following transcripts of these terriers and other church related documents have have been left in their original form wherever possible with some explanatory notes by myself. An indenture dated 6th March, 1533 (1534). “The rectory or chapell’ of Nonyngton and Wemyngeswolde. Ferme of all that messuage or barn called ‘le parsonage’ of Nonyngton and Wemyngeswolde with one acre of glebe lande; also all the tithes of grain growing in Nonyngton and Wemyngeswolde. Except from the mansion house called ‘Le Vicaredge’ and from all the lands belonging to the same vicaredge demised to Joan Bynghame, widow, by indenture vj (5th) March xxxv Henry VIII (1547/8). For j (one) years, yerely xxxiij l.(£.33)“. From a visitation document of the same period: “stipend of a chaplain keeping the cure (curate) of the parish or chapell’ of Nonyngton. Nothing. Because the chaplain that serves the same cure has the home there called ‘Le Vicaredge’ and the lesser tithes. Nothing”. The rectories of both Nonington and Womenswold were both part of the College of Wingham at this time and were obtained for the parishes by exchange in 1561. There is a reference in the Patent Rolls of 1560-63 to “the rectory of Nonnyngton and Wyneswolde, late of Wingham College; the messuage and barns called ‘ le personage of Nonnyngton and Wymynge Estwell,’ now or late in the tenure of Christopher …(name indistinct)…… and late of Wingham College..”. A terrier of 29th August, 1615. 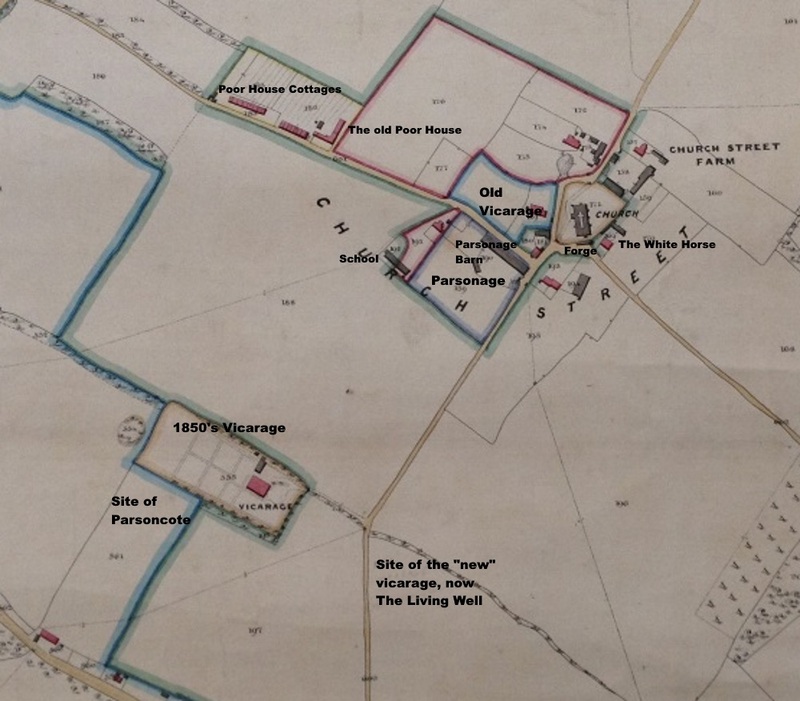 “Ther ys belonging to parsonage one barne; one barne yard; and a pasture close of one acre, and a yard more or less adjoining to the barne, lying to the Kyngs Hye Way north and west (Vicarage Lane and Church Street respectively) and to the lande now or late of Sir John Wyles south and east. “Ther is belonging to the vycaridge one dwelling house and kytchin with a garden or orchard with a pasture close adjoining contayning by estimation one acre more or less. Lying to the lands of Thomas Kyrby and the Kyngs Hye Way east (Church Street) to the lands of Sir John Wyles south, to the lands of (blank) Stokes west and to the Kyngs Hye Way by the churchyard north (Old Court Hill). 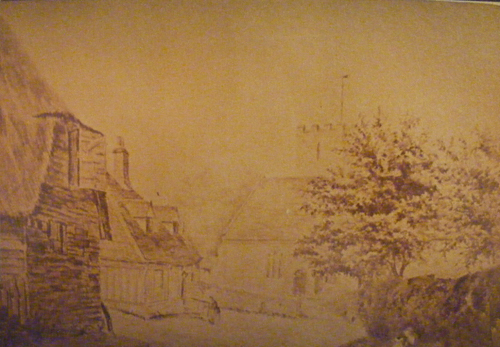 St Mary’s Church in the mid-distance with the gable end of the thatched Parsonage Barn mention in 1615 to the left front of this early 1800’s sketch of the church viewed from Church Lane (now Vicarage Lane usually referred to as Oak Hill). The barn survived until the last part of the 19th century. In 1679 (below) it is referred to as ‘a long parsonage barn’. A lease between the Archbishop of Canterbury and William Hammond of St. Alban’s Court, Nonington of 7th July, 1679. “Lease for 3 lives between the Archbishop of Canterbury, lessor, & William Hammond of St. Alban’s Court, Nonington, lessee. “Parcells: parsonage & rectory of Nonington & Wymenswold with the glebe land by estimation 2 acres on part of which stands a long parsonage barn together with a stable and ffathering place (threshing floor) which said glebe lands are bounded on the west & north to the Kings Highway & on the east and south to lands now or late of Jeremy Gay, gent. (of Holt Street Farm) & all tythes portions pensions & profit. “Exception of the mansion house called the vicaridge and land to the same belonging. “Terms, the lives of the said William Hammond, Elizabeth his wife & William Hammond, eldest son, their ages are 45, 30, & 15 years respectively. Rent £33 and a further rent of £20 which is to be paid by the Archbishop of Canterbury to the Vicar of Nonington in pursuance of the King’s instruction & directions for augmentation in that behalf given”. 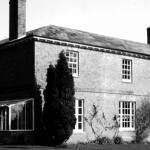 At some time after the date of the above lease and before the next terrier ‘Le Parsonage’ came into the ownership of the Hammond family where it remained until the disposal of the family estate in the late 1930’s. “a true note of terrier of the tenements, glebe lands and tythes belonging to the curacy of nonington and wymenswold “(extracts for Womenswold have been excluded). “Imprimus. One house or tenement opposite the south side of the churchyard wall (the vicarage). “item. One piece or parcel of land contigeous to and on part of which the said house or tenement is built containing in the whole one acre wanting six perches”. “Imprimus: there is a small vicarage house and about 40 perches (a quarter of an acre) of garden, these premises are bounded in the n.w. to land (now Farthingales)belonging to Sir Brooke Bridges bt. (of Goodnestone), on the s.w. by the glebe pasture, on the s.e. by land belonging to W. O. Hammond esq. And a public road leading from Womenswold to Nonington church (Church Street). Three bells whereof the tenor weighs 1800 pounds. One beir (for carrying the deceased at a funeral). Cloth and cushion for the pulpit. Hangings for the ministers and the clerks desks and alter, of purple cloth. One folio bible, ditto prayer book for minister. One folio prayer book for the clerk. Two quarto prayer books for alter. Two silver plates for the offertory. One old oak chest used to keep registers. One iron ditto now used to keep registers. A damask cloth and napkin for the communion table. Purple cloth cushions for the alter rail..
By the date of the lasat terrier most of the land attached to ‘Le Vicaredge’ has been disposed of by the Church. 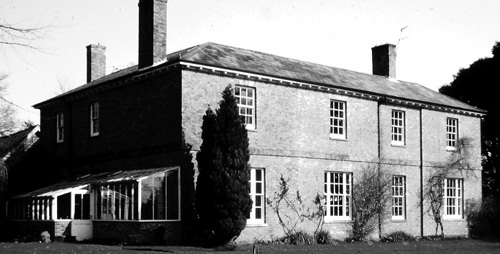 The building was superceded as the vicarage in the late 1840’s when a new and much larger house, the present ‘Hatchetts’, was built by the then incumbent, Thomas Harrison (1845-1853), who was a man of considerable private means. The house was later rented out as following incumbents could not afford to live there. It was built on part of a field called Hatchetts due to its L-shape which was obviously thought to resemble a hatchet, hence the name. The new house was built on the longer ‘handle’ of the hatchet. The Hatchetts, Nonington’s second known and grandest vicarage. ‘Parsoncote’ was built in the 1890’s for the personal use of the Reverend Sydney Sargent with contributions of land and money from Hammonds of St. Alban’s Court, and the Plumptres of Fredville. It is built on the shorter ‘blade’ of the hatchet to the south of Hatchetts. 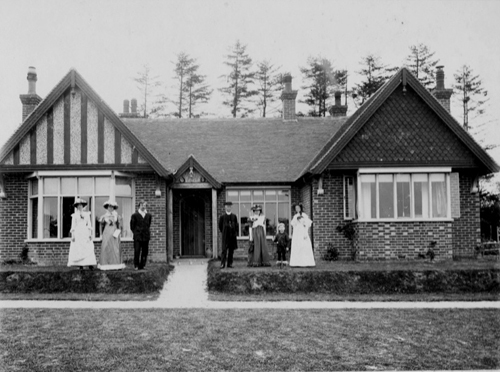 The bungalow remained in the Reverend’s possession after he retired and on his death was passed to his son, the Reverend Lawrence Sargent who lived there until his death when it was then sold. After the sale the bungalow was for some years known as ‘Kent Cottage’, but recently it has reverted back to the original ‘Parsoncote’. Parsoncote in 1896, soon after the bungalow was built. The figures on the right the Rev. Sidney Sargent and family. The Reverend recieved a special permission from the Archbishop of Canterbury to live in the bungalow instead of the adjacent parsonage, The Hachetts. 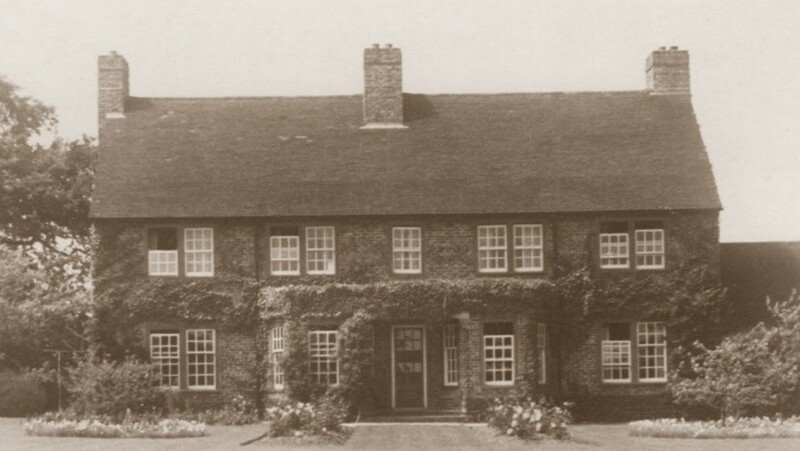 In the 1920’s a new vicarage was built at the top of Oak Hill (Vicarage Lane) directly opposite the entrance to ‘Hatchetts’ to accommodate the vicars of Nonington Church who followed the Reverend Sydney Sargeant. The new vicarage, now known as The Living Well. How lovely to see the old photos and history of these two houses. I live in Parsoncote and the trees behind are a lot taller now!! Thank you for your comments. I’m glad you enjoyed the site. You may already know, but I have now officially changed the name of the bungalow back to ‘Parsoncote’ with Dover District Council so feel free to update the site and remove references to ‘Kent Cottage’!